See view, 75m² pool, sauna, fireplace, 5 bedrooms, 4 bathrooms, piano, air cond. Villa Don Miguel is a real paradise for small or big families or groups of friends as well as for couples searching for a romantic, relaxing holiday home with space and comfort. The personally designed and well equipped villa provides enough space for up to 10 people. The villa is situated within a beautifully landscaped garden on a 10,000 m "plot with breathtaking panoramic views, equipped with a private access road.The villa has a large palm-fringed pool area with a 75 m² heated pool and from the large sauna above as well as from the pool and the main terrasse you have a beautiful, unobstructed view to the Atlantic Ocean. The Villa Don Miguel is located on the edge of the Aridane Valley on the sunny west side of the island of La Palma. In the villa you will enjoy complete privacy. Moreover, the location is ideal to enjoy all the benefits of the island. The necessary infrastructure for shopping can be reached by car in 5 (El Paso) or 10 minutes (Los Llanos). Also some very nice beaches (Tazacorte, Puerto Naos or the Charco Verde) can be reached within 15-20 minutes by car. For hikers, an excursion to the Caldera de Taburiente or the volcano route is recommended; Both destinations are also within a short time. The villa has four double bedrooms and three bathrooms as well as a guest toilet in the main building. All beds were equipped with high-quality plate slatted frames and orthopedic cold foam mattresses in various degrees of hardness. The same comfort was used as part of the separate guest house, which has a kitchen, a bathroom and a bedroom, a fireplace and a private balcony. Both houses are rented as a whole to a party, so that nothing stands in the way of the private holiday pleasure. The round kitchen is fully equipped (dishwasher, refrigerator, stove, food processor, coffee maker, Nespresso machine, toaster, etc.) and there is plenty of crockery and cutlery for all guests. In addition to the spacious round living room with fireplace, there is a separate TV and piano room with a cozy couch corner. All bathrooms have been completely renovated in 2017 with natural stone slabs and modern sanitary elements. The villa has gas heating, i. modern radiators in the basement and underfloor heating in the upper floor. The bedrooms are all air conditioned. Warm water is primarily produced by solar energy, only secondary with gas or electricity. On the main terrace, there is a table for 8-10 people and other comfortable seating. For joint barbecues a gas grill is available. At the pool there are also high quality stainless steel couches for up to 10 people. There are also various smaller terraces with seating available. In the garden are numerous fruit trees (khaki, apple, orange, Cherrymoya, pomegranate, hazelnut, grapefruit, lemon, Nispero, etc. ), which of course can be eaten by the guests depending on the season. Pool towels are provided. Bed linen and towels are changed weekly. For entertainment there is a large flatscreen TV with internet access and a Bluetooth music system (Bose). Wi-Fi with 12 Mbits is also available. A piano is also part of the Villa Don Miguel. Also for children, especially for those from an age of 5-6 upwards, the house and the garden are a real paradise, with the big pool, the table tennis and lots of space even for big groups of families or friends. Guests have access to all rooms of the house. The guest house is opened for a minimum of 9 people. When there are less than 9 guests we open the house for an additional charge per day. There are two baby beds and two special chairs for babies as well as an indoor protection for the stairs available. The rental fee includes all services as towels, bed linen, air condition, sauna, heating, pool (solar heating in summer and additional electric heating in winter, temperatures in winter 20-24 degrees, in summer more) and a person in charge near the house. The price includes a change of linen per week (bed linen / towels) and one interim cleaning in case of a minimum stay of 14 days. We charge a security deposit of 500 EUR which will be refunded within 7 days after departure in case there are no damages. The prices in the calendar are valid for an occupancy of 1-3 persons. For each additional person we charge 25 EUR per night. The guest house can be booked for an additional daily rate . In case there are at least 9 persons paying, the guesthouse is included in the rental fee. Heating and air conditioning as well as the use of the sauna are included in the price. Max. two babys under 2 years in extra beds are without charge. It's been many years since I first came to La Palma with my family. Since then, the island has not let go of us. In addition to the wonderful nature and the low tourist enforcement, the tranquility and serenity has cast its spell over us there. La Palma is the perfect island for peace seekers and nature lovers! Where else can you go in the morning for hiking in the mountains and in the afternoon a few hours to the beach? In our house we invested a lot of heart and made every effort to make everything as comfortable as possible. We want guests to feel at home here as much as we do. Sitting on the terrace in the evening and watching the starry sky is just one highlight! I mostly like the stunning views over the ocean and the landscape we can enjoy from our terrace and the house. Villa Don Miguel is a real retreat for me and my family. With the views and the comfortable climate we can fully relax from our day to day business. The villa is very conveniently located for leisure activities of all kinds. Due to the central island location, many wonderful places of the island are reachable within a short time (by car). Nevertheless, the house offers absolute peace and privacy. The location also offers fantastic panoramic views of the Caldera Mountains and the sea. La Palma offers a variety of activities from hiking, mountain biking, paragliding, boat tours to stargazing, etc., especially nature and tranquility. Good restaurants, beaches and places for strolling and shopping are also available. If you just want to relax, do so extensively at Villa Don Miguel. Wir haben ab Anfang März 2019 mit 5 Erwachsenen und 3 Kindern zwei wundervolle Wochen in der Villa Don Miguel verbracht, auch wenn zu dieser Zeit die Temperaturen vor allem abends noch etwas kühl waren. Das Haus hat unsere Erwartungen voll und ganz erfüllt. Der Blick ist wirklich phantastisch. Der terrassenförmig angelegte Garten mit Pool sowie das Innere des Hauses sind sehr individuell und mit viel Liebe gestaltet. Die hochwertige Ausstattung ist durchdacht und lässt keine Wünsche offen. Anfahrt, Schlüsselübergabe, Zwischenreinigung etc. waren perfekt organisiert.Bei Rückfragen und Wünschen hat Frau Müller immer prompt (oft schon nach wenigen Minuten) reagiert. Der Preis ist insgesamt absolut angemessen, lediglich 350€ Zusatzkosten für die Poolheizung (um diese Jahreszeit wohl unumgänglich) fand ich etwas hoch. Lieber Thomas, vielen Dank für Ihre gute Bewertung. Ich freue mich, dass Sie eine schöne Zeit hatten und Ihren Aufenthalt genossen haben! Sie und Ihre Familie sind jederzeit wieder herzlich bei uns willkommen. Hinsichtlich der Poolheizung kann ich verstehen, dass Ihnen die Kosten recht hoch erscheinen. Wir geben hier aber tatsächlich nur die laufenden Energiekosten weiter. Diese sind aufgrund der Größe des Pools natürlich relativ hoch. Eine Rolle spielt sicherlich auch, dass sich der Pool aufgrund seiner Form und baulichen Gegebenheiten leider nicht problemlos abdecken lässt. Wir arbeiten derzeit hier noch an einer Optimierung. Wir hatten in diesem Haus einen sehr schönen Urlaub. Das Haus hält so ziemlich alle Annehmlichkeiten die man sich vorstellen kann bereit. Es ist sehr groß und stilvoll eingerichtet. Es wird nicht unser letzter Urlaub hier gewesen sein. We were with 9 adults (Group of friends) in villa Don Miguel in february 2019 and have had a fantastic time. The villa is spacious, has a beautiful view, beautiful garden and a very nice swimming pool. The rooms are spacious and beautifully furnished with very nice bathrooms. The kitchen is very well equipped. There is a fireplace, a lounge corner and separate tv room, so plenty of room for everyone. Table tennis and sauna made it complete for us. And last but not least a beautiful terrace with large dining table where we spent a lot of time. In short, a great place to celebrate your holiday and recommended for everyone. dass keine Wünsche offen läßt. Wir haben hier zu dritt jeder unseren eigenen Schlafraum ebenso genossen, wie auch all die übrigen mit viel Liebe zum Detail eingerichteten Räumlichkeiten. Eine immer erreichbare Gastgeberin stand uns jederzeit ebenso mit Rat und Tat zur Seite wie die direkte Betreuung vor Ort und da auch das Wetter mit 14 Tagen "Blauer Himmel Sonnenschein" diese wunderschöne Insel erstrahlen ließ, gibt es hierfür nur ein dreifaches "PERFEKT - PERFEKT - PERFEKT"
Die Villa don Miguel ist wirklich ein Traum! Alles war perfekt sauber und wunderschön! Die Villa ist sehr liebevoll und hochwertig eingerichtet. Was uns besonders gut gefallen hat, das man auch mit 10 Leuten, seine Privatsphäre und Ruhe haben kann, dank der großräumigen Aufteilung. Das Grundstück ist riesig und es gibt viel zu entdecken rund um die Villa, mehrere stille Ecken etc. Die drei Badezimmer im Haupthaus sind ein Traum, genau wie die Schlafzimmer und anderen Räume. Die Ausstattung des Hauses ist sehr umfangreich, in der Küche gibt es quasi alles was benötigt wird um auch komplexe Gerichte zu kochen oder zu backen. Als gesamt Resümee können wir nur sagen: Jederzeit gerne wieder! Und die Vermieter sind super nett und hilfsbereit! The villa is very conveniently located for leisure activities of all kinds. Due to the central island location, the main attractions of the island are almost all reachable within a short time (by car). Nevertheless, the house offers absolute peace and privacy. 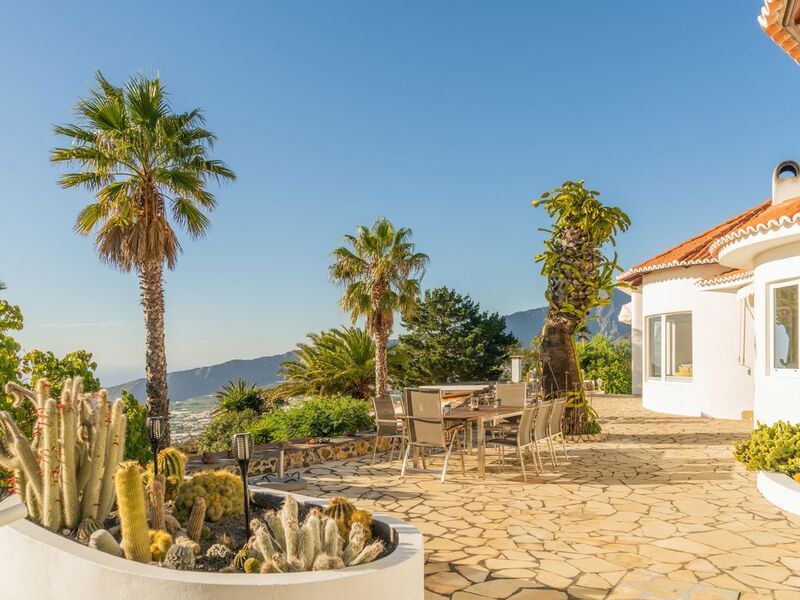 The location also offers fantastic panoramic views of the Caldera Mountains and the sea. Die Preise im Kalender gelten für 1-3 Personen. Für jede zusätzliche Person berechnen wir 25 EUR pro Person und Nacht extra. Die Kosten für die Klimaanlage, die Poolheizung, die Sauna, die Endreinigung (ggf. Zwischenreinigung und Waschewechsel bei einem Mindestaufenthalt von 14 Tagen) sowie die Gasheizung sind im Mietpreis enthalten. Bei einer Gästezahl von mindestens 8 Vollzahlern öffnen wir auf Wunsch gegen eine zusätzliche Gebühr von 25 EUR pro Nacht auch das Gästehaus, bei mindestens 9 Vollzahlern wird das Gästehaus ohne Zusatzgebühr geöffnet (5. Schlafzimmer und 4. Bad sowie Kochnische, Wohnzimmer, Kamin, TV). Bei 6-7 Vollzahlern wird eine Zusatzgebühr von 40 EUR und bei 4-5 Vollzahlern eine Zusatzgebühr von 60 EUR für das Gästehaus erhoben. Max. 2 Kleinkinder können im Zustellbett untergebracht werden. Wir weisen jedoch vorsichtshalber darauf hin, dass es auf dem Grundstück aufgrund der Hanglage viele Mauern und Treppen gibt, Kinder bedürfen also der Aufsicht. Die Treppe im Haus ist abgesichert. Der Pool ist komplett eingefriedet und durch Tore (ohne Schlüssel) geschützt. The prices in the calendar are for 1-3 persons. For each additional person we charge 25 EUR per person and night extra. The cost of the air conditioning, pool heating, sauna, final cleaning (and interim cleaning and change of linen/towels in case of a minimum stay of 14 days ) and gas heating are included in the rent. If there are less than 9 guests, we open the guest house on request for an additional fee per night (6-7 full payers: 40 EUR per day, 4-5 full payers: 60 EUR per day). From 9 full payers the guesthouse (bedroom, bath) is open without extra charge . Max. 2 infants younger than 2 can be accommodated in an extra bed for babies . However, as a precaution we point out that there are many walls and stairs on the property because of the hillside situation, which are unsuitable for small children. The stairs in the house are protected. The pool is fenced.